Nina Hatch, chair of NAEE’s executive committee writes about the award of a Green Apple. Awards come in all shapes and sizes and can mean a great deal (or not) to the recipient. The one NAEE has just received really is Green Apple shaped and mounted on a gold coloured engraved plinth. I do not know what the apple is made from – it certainly isn’t edible, and I couldn’t feed it to my pigs. But the accompanying certificate assures me that this was presented to us during a carbon-neutral presentation ceremony at the Houses of Parliament on Monday November 12th. That is appropriate to the aims of our Association and for the international Green Organisation which funds and presents these awards. A donation has also been made on our behalf to the Green Earth Appeal whose tree planting in the world’s poorest communities not only helps the environment and wildlife, but also creates jobs and changes lives. When we arrived at the Houses of Parliament we had no idea what this presentation would entail. The ‘we’ being myself accompanied by Sue Fenoughty and Gabrielle Back, long standing members of the executive committee. Just walking along seemingly endless corridors where the decoration and architecture is still the same as when AWN Pugin designed it, gives you a sense of impending importance. At the Terrace Room overlooking the Thames, the room was buzzing with representatives from a wide range of companies and organisations. 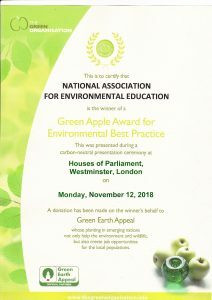 We were all there to receive a Green Apple in recognition of projects that had made a significant, and usually sustainable, impact upon some aspect of the UK’s environment. When it was announced that NAEE had won Gold (the highest category) for environmental best practice within education I was surprised, but also delighted. For this is an acknowledgement for NAEE members who have put so much voluntary commitment into running the Kenrick Days project, and for our unique journal Environmental Education which has been published for over 50 years. With many awards being presented my one regret of the afternoon is that we had no time to tell other recipients exactly what we do. There were managers of shopping centres, architects, representatives from water companies and wildlife trusts and even some primary school children from Wales who had persuaded their local authority that they MUST have their milk in recyclable glass bottles. All passionate pioneers in their own area of environmental awareness. So what does this mean to NAEE? For the Kenrick Days project it shows the family of the late Hugh Kenrick that their philanthropy is well placed. By providing bursaries to Birmingham and West Midlands schools to visit environmental study centres they are supporting teachers who can then help young people to learn about our place in the natural world and the pressures that our lifestyle is placing on it. For our journal which has reached edition number 119 it is recognition of many years of sourcing, editing and publishing articles which will be relevant to teachers and our supporters. So a Green Apple can mean a lot.